Most discussions involving infrared light revolve around military applications and night vision devices. While this is one of the more extensive uses of light in the infrared end of the light spectrum, it is by no means the be all end all of practical infrared light uses. While the most notable trait of infrared light is its invisibility to the human eye, the reasons why it is outside the spectrum of visible light are also why it has so many other practical applications as well. Infrared light is the same as visible light in that it is electromagnetic radiation. It behaves the same as visible light and can be manipulated the same way visible light is. Infrared light is reflected or absorbed according the properties of the materials it contacts, just like visible light. Infrared light can also be focused, reflected, and diffused, again just like visible light. The difference for human beings is that it has an electromagnetic wavelength that our eyes cannot register, thus it is “invisible” to us. It is the reasons it appears invisible to us, however, that lend infrared light its unique and practical properties that make it so useful to use even though we cannot see it. Infrared light appears invisible to use because it has a wavelength that is too long for our eyes to register. Human beings in reality only see a narrow band of the electromagnetic spectrum which we call visible light. The electromagnetic spectrum itself is made up of a wide range of wavelengths, with microwaves, heat, ultraviolet light and infrared being the more commonly known parts that are invisible to the human eye. As we move up or down the electromagnetic spectrum, the wavelength changes and thus the properties of electromagnetic radiation in each range change as well. This is why we can see electromagnetic radiation as a change of colors according to how hot something is. For example, we can heat a piece of iron and watch it go from dull red, to bright orange, to white as it gets increasingly hot. This is because as we increase the temperature of the iron, the wavelength of the electromagnetic radiation emitting from the iron becomes increasingly shorter. This is the same thing we see with the electromagnetic spectrum as we move from one end to the other, such as when we break up light with a prism and see a row of individual colors. What makes light in specific regions of the infrared end of the spectrum useful is that while it is absorbed or reflected off of objects just like visible light, it is a single narrow band of electromagnetic radiation rather than a blend of several. Normal visible light is a blend of several shorter electromagnetic wavelengths (colors) that is easily reflected by objects. Each wavelength, or color, is absorbed and reflected a little differently than the next according to the physical properties of an object it strikes. As a result, certain materials and textures reflect each wavelength differently. While this allows us to see the different colors of an object, it also means that many details may remain hidden to us because the visible part of the spectrum is more easily reflected and the infrared light being reflected is invisible to us. Imagine if you will a piece of paper with red and green dots on it. If you were to shine a regular lamp on this paper, each dot would be clearly visible as an individual color. However, if you were to shine a pure green light on the paper, the green dot would remain green, while the red would appear a very dull greenish brown, or even black. This is because the particular properties of the material that makes the green dot appear “green” cause it to reflect only green light and absorb other colors. This is how light makes an object appear to have a certain color. So with nothing but green light shining on the paper, the red dot will absorb the green light while the green dot will reflect virtually all of the green light. This happens with every part of the electromagnetic spectrum, which opens up interesting possibilities for using specific parts of the spectrum to illuminate objects according to their specific properties. Infrared spectroscopy is a process used in chemical research and industry. Since certain materials absorb and reflect infrared light differently, scientists can apply infrared radiation to an object and determine its molecular structure, its purity, concentration, and element ratios. Basically, how an object absorbs IR radiation can tell us what that object is and what it is made of. For instance, in greenhouses it is important to maintain CO2 levels within a certain range in order to obtain optimal plant growth. With infrared spectroscopy it is possible to sample the air within the greenhouse and determine how high the CO2 concentration is. Other uses for IR spectroscopy include quality control in polymer manufacturing, foodstuffs production, and forensic analysis of evidence in criminal investigations. Infrared reflectography is a process by which infrared light is most commonly used to illuminate normally hidden details in artwork. Visible light is normally reflected off of the surface of a painting, allowing us to see colors and contrasts. However, since the shorter wavelengths of visible light are either simply reflected or absorbed, we do not see past the first initial layer of paint. Long wave near infrared light on the other hand penetrates through the paint layers, revealing to us whatever may lay on the canvas beneath the paint. In effect, the infrared light makes the initial layer of paint appear almost transparent when viewed with an infrared camera. By applying infrared light to a painting and then capturing the infrared energy reflected back using an infrared camera, we can see details beneath the paint such as an older painting, signatures, underdrawings, and contrasts between different types of paints. This is a popular method for determining the authenticity of a painting, whether or not it has been altered or restored, and whether it is the work of a particular artist or a copy. Machine visioning systems are used to manage manufacturing processes, for quality control, and maintaining evenness between products. In basic machine visioning systems, visible light is used to illuminate an object, which is then photographed by the machine. The machine then compares this photograph to a known good “proof”, and if it finds variances, then flags this object as irregular. The problem with this process is that the short wavelength of visible light does not reveal fine imperfections such as hairline cracks very well, and may produce problems with contrast and overexposure on highly reflective surfaces that make it difficult for the machine to detect imperfections. Infrared light, however, is more readily absorbed and penetrates materials more deeply. This allows infrared machine visioning systems to note internal defects and irregularities. IR light also returns a much clearer reflection of defects and imperfections, making it possible to greatly improve the efficiency and accuracy of a machine visioning system. These are just a few examples of how infrared light is applied to a whole host of applications outside of military night vision systems. 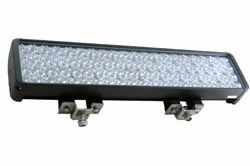 In almost every industry infrared lighting is used in some manner during some part of the manufacturing process from design and development, to quality control and distribution. As infrared technology continues to advance, the range of applications continues to grow as well. With the advent of infrared LEDs the application of infrared technology is guaranteed to see an even greater increase in advancement.